Eternal Orthodox Church calendar for the 23.06 year 2017. 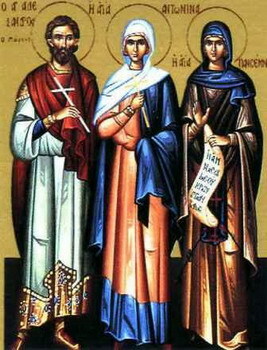 Antonina was a virgin and Alexander an imperial soldier, both from Alexandria and both Christians. Antonina was first taken before the judge and tortured. When they threw her into prison, Alexander went to it at the command of an angel of God (being up to that time a stranger to Antonina), draped her in his military cloak and told her to keep her head lowered and go out through the guardhouse in front of the gates. In this way, she escaped and he remained in the prison. They brought Alexander before the judge, and began to interrogate him for the name of Christ. When Antonina heard of this, she came before the judge herself, and he put them both to various tortures. He cut off their hands and then flayed their naked bodies, scorching their wounds with torches, and finally cast them into a fire set in a hole in the ground, covering them with earth. They suffered with honour for the name of Christ and entered into the courts of the heavenly King on May 3rd, 313. The wicked judge, Festus, became dumb at the time of the martyrs" deaths, and an evil spirit fell on him, torturing him for seven days before killing him. A pagan born in Syracuse of eminent and wealthy parents, he studied philosophy in Rome. At his own desire, he was baptised by the devout elder Gordianus. This offended his parents and, to escape their wrath, he went to Ravenna on the advice of St John the Theologian, who appeared to him, and there in Ravenna made himself known to the bishop, Ursus, a kinsman of his. On the bishop"s instructions, Bassian found lodgings near the Church of the Holy Martyr Apollinarius outside the city, and there laboured a long time in toil, fasting and prayer. When the Bishop of Lodi in Liguria died, Bassian was elected, not according to his own desire but through a revelation in a dream. He was consecrated by Ambrose of Milan and Ursus of Ravenna. He had a great gift of healing, and could even raise the dead. 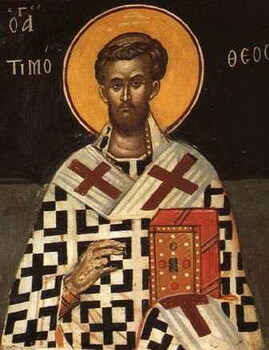 He was present during St Ambrose"s last hours and heard from those holy lips how Ambrose had seen the Lord Jesus Christ. He lived to a great age in toil and asceticism and finished his earthly course at the age of ninety, entering into the Kingdom of God in about 409. His holy relics continue to work miracles as a witness to the power of God and the greatness of His saint. Епископ; у миру се преставио.